NASA's spectacular landing of the Curiosity rover on Mars sparked a red tide of media coverage in August, including stories by a half-dozen national reporters trained in the SciCom program. Four program alumni were on scene at the Jet Propulsion Laboratory in Pasadena, California, on the night of August 5 for the landing of the probe, formerly called the Mars Science Laboratory. The reporters were Kenneth Chang '95 of The New York Times, Nadia Drake '11 of Science News, Lisa Grossman '09 of New Scientist, and Mike Wall '09 of Space.com. Two other SciCom graduates are covering the mission from their remote offices: Adam Mann '10 of Wired.com in San Francisco and Clara Moskowitz '07 of Space.com in New York. Kenneth Chang: "Simulated Space 'Terror' Offers NASA an Online Following" (July 10); "Curiosity Rover Lands Safely on Mars" (August 6); "Mars Looks Quite Familiar, if Only on the Surface" (August 13). 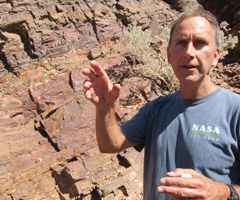 Nadia Drake: "Young scientist crosses fingers for Mars rover" (August 1); "A lifetime of curiosity: An interview with JPL director Charles Elachi" (August 4); "Curiosity lands safely on Mars" (August 6). Lisa Grossman: "Death Valley provides rover's-eye view of Mars geology" (May 11); "NASA jubilant as Curiosity rover lands safely on Mars" (August 6); "Where next? Curiosity's scientific priorities on Mars" (August 7; free subscription required). Adam Mann: "What NASA's Next Mars Rover Will Discover" (June 25); "Lasers, Cameras and Particle Detectors: Mars Rover's Super High-Tech Science Gear" (August 3); "Humans on Mars: The Craziest, Weirdest, and Most Plausible Plans in History" (August 9). Clara Moskowitz: "Despite Risk, Experts Bet on New Mars Rover's Audacious Landing Plan" (July 23); "Mars Rover Curiosity Beams 1st Photos Back from Red Planet" (August 6); "Life on Mars Time: Scientists Adapt to Curiosity Rover's Red Planet Trek" (August 7). 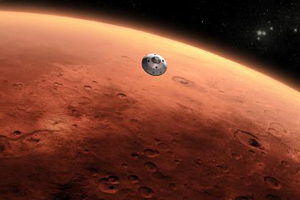 Mike Wall: "Should NASA Ditch Manned Missions to Mars?" (August 5); "Amazing Mars Rover Landing Video Captures NASA's Daring Descent" (August 6); "A Week on Mars: Curiosity Rover Settles in for Long Martian Haul" (August 13).